Grand Theft Auto: Vice City differs from other series of this game thanks to its setting and gameplay. This is the second 3D game included in the Grand Theft Auto series. It uses the game engine exploited in GTA III (the version itself is built on this) with a huge cityscape that is wholly populated. 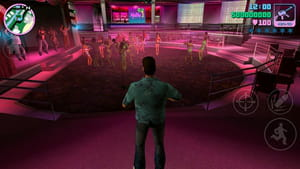 This game is set in 1986, in the fictional Vice City that is modelled after Miami Beach, Florida. Music, fashion, cards, and characters parody the 1980s. During gameplay, gamers can steal cars, boats, and even helicopters. For this version, they can also buy property distributed across the city. Compared to other versions, this version offers a large collection of licensed music from the '80s. Players can select with a tap which track to listen to during a game session. Playlists can also be synchronized with iTunes. Most interestingly, this version supports iCloud synchronization, allowing users to pause and pickup gameplay across their devices. Latest update on February 4, 2019 at 03:38 AM.